Part Time Research Assistant Social Science job recruitment in Tripura Universityon purely temporary basis Research project titled 'Internet Addiction among Women In Tripura: A Study on the User Behaviour with Special Reference to College-going Students in West Tripura District' Qualification: M.A. in any discipline of Social Science with at least 55% marks . No.of Post: 1 Remuneration will be paid as per the norms of the project. A Walk-in-Interview will he held on February, 28. 2018 at the Women's. Studies Centre. 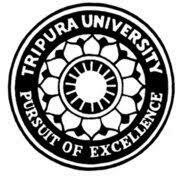 Tripura University at I PM.